We used a marketing strategy that targeted both money managers and maintenance managers, the two persons who felt the most pain when a piece of equipment would break down. 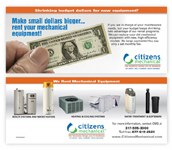 From left to right: Direct mail post card sent to businesses that were dependent upon hot water, Bill Stuffer sent to existing clients, CMS Web Site targeted to niche industries, and the CMS Trade Show Display that was used at maintenance trade shows. 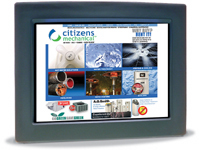 Project: The client wanted to increase sales of their commercial mechanical services. In many cases when you market to a customer, you will be trying to convince more than one person to use your services. You have to plan for different mindsets in order to sell your products or services. This proved to be true in the case of CMS and its promotion of commercial mechanical services. We marketed heavily to niche trade groups, particularly those that were dependent upon hot water for their operations. Two groups within these industries were identified as our target: the persons in charge of the operational budget and maintenance managers who were responsible to keep equipment running. We pushed a budget-friendly rental option to the money managers and the reliability of having a service guarantee to the maintenance managers. 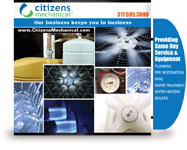 We marketed awareness of these services through a steady direct mail campaign, newsletters, bill stuffers and involvement at industry trade shows. We pointed customers to the company’s web site, which was divided by specific industries and products. Each page of the web site advertised the rental agreements. This proved to be a very effective way to reach our target audience. Take a look at the web site. Before we were involved with CMS, they had multiple years of declining revenues. We were able to work with their internal sales and marketing personnel to turn all of this around. We were so effective that the parent company positioned CMS for sale and sold the business in 2009.